Seeing as the Sonnets were composed by a playwright, it was only a matter of time until references to acting popped up and such is the beginning of Sonnet 23. This Sonnet centers mainly on the notion that the persona would rather have his writing speak for him as he trusts not in his own eloquence or maybe this love is just too strong to express in actual speech. Shakespeare begins by likening himself to an actor overcome by stage fright who consequently forgets his lines. Such is the intensity of his love for the Fair Youth, it leads him to a state of utter speechlessness. Could it be an attempt at justifying this sequence of Sonnets for surely no lover would be continually satisfied by mere writing or is this 'love' being accorded the power of rendering someone speechless? From the image of a meek actor struggling to remember his lines, Shakespeare takes us to an animal or indeed a human being, "...some fierce thing..." weakened by excessive passion, love and affection. Weakened to the extent of failing to express fully what a lover should. It would seem, the persona is implying that he needs time to compose himself and express fully in writing how he feels. In line 8 the persona proclaims, "O'ercharged with burden of mine own love's might," there are instances that he is simply overwhelmed by what he feels and that is when the writing takes over. Another way to interpret this particular line would be to assume that it is actually in these times that the loves is at its weakest because how can a true lover fail to say what needs to be said at any given moment? interesting perspectives if one considers that it means when he or she prefers to text you rather than speak to you in person they've been overcome by emotion or if the second viewpoint is to be considered more accurate, texts are but a veil to a feigned love. Real love is best expressed by word of mouth. The third quatrain brings into play a slightly provocative perspective to this whole writing versus speech predicament as it now seems as if Shakespeare might just be endorsing his writing to give the Fair Youth the impression that this is the most efficient and emotionally rewarding form of correspondence. Doubtlessly the writing is great but to assert that no form of speech would suffice to rival these Sonnet like a bit of a long shot. Granted Shakespeare was never known for exceptional oratory capabilities but word of mouth just automatically carries with it a greater significance than writing would. Ultimately though, the persona knows what is best for his lover. 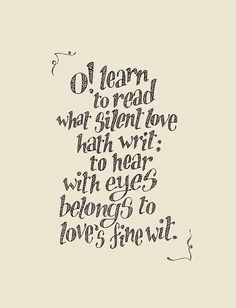 Whilst the debate on who the Fair Youth actually was is very far from reaching a conclusion, the one sure-fire this is he was a literati of some sort as the final couplet implores him to 'read between the lines' to find the tid bits of love hidden in this Sonnet, much like what we are trying to do. One has to assume this sort of thing worked with the Fair Youth as there are a 154 of these metaphoric mazes.